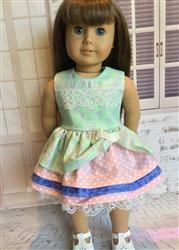 ﻿An adorable sleeveless dress, pretty lace bolero jacket and knitted hat create this delightful and very girlie outfit. The sleeveless dress has a lined bodice, trimmed with eyelet lace and ribbon, atop a full gathered 4-tier skirt. The skirt has frayed hem edges and lace trim on the bottom layer to give the dress a soft look. The top tier is gathered on the left and adorned with a bow. The dress closes with hook and loop tape in back. The very easy long-sleeved bolero jacket is constructed with a Centre Back seam, two side seams and a facing for a neat finish. The Jacket front is decorated with ribbon roses or buttons and embroidery stitches if desired. Bonus Pattern: The very easy knitted Rolled Brim Hat has ribbon threaded just above the brim and is decorated to match that of the jacket. Fabric Used – Quilter’s Cotton was used for the dresses; Eyelet Lace and Satin Ribbon were used for the Bodice Trim. Eyelet Lace was used on the hem edge of the dress. The bodice was lined with Lightweight Cotton. Eyelet and Medium-weight lace was used for the Jacket. For my Hats, I used Elle Classic Wool – Aran. -Matching Thread, Marking Pen, Point Turner, Homeostatic Clamp or Scissors-type Tweezers, Clear Tape, general sewing supplies. -A ‘Universal Sewing Needle – 80/10’, a Walking Foot, a General Purpose Foot and a ¼” Foot are used during the sewing process. What You Get: One 43 page sewing (and bonus knit hat) pattern that you digitally download as a PDF file so you can start your project immediately! The PDF sewing pattern provides full color step-by-step illustrated instructions and full size pattern pieces. A PDF reader is required to view and print the files (example: Adobe Reader or Preview for MAC). The download link is received immediately after the transaction is complete. Print copies are NOT available. Beautiful pattern with well written instructions. This produced the sweetest little dresses. I just love putting various fabrics together so this was right up my alley! The entire dress went together very well. As you might expect, it is a challenge to gather so many layers together, but the result makes it all worth while. This is a very good pattern and I have a wonderful response to my completed dresses. As with every pattern that I have purchased from this designer, I adore this Lacie pattern. It is a beautiful fit, easy to put together with clear and precise instructions. The attention to detail is wonderful and the look of this dress is just charming!